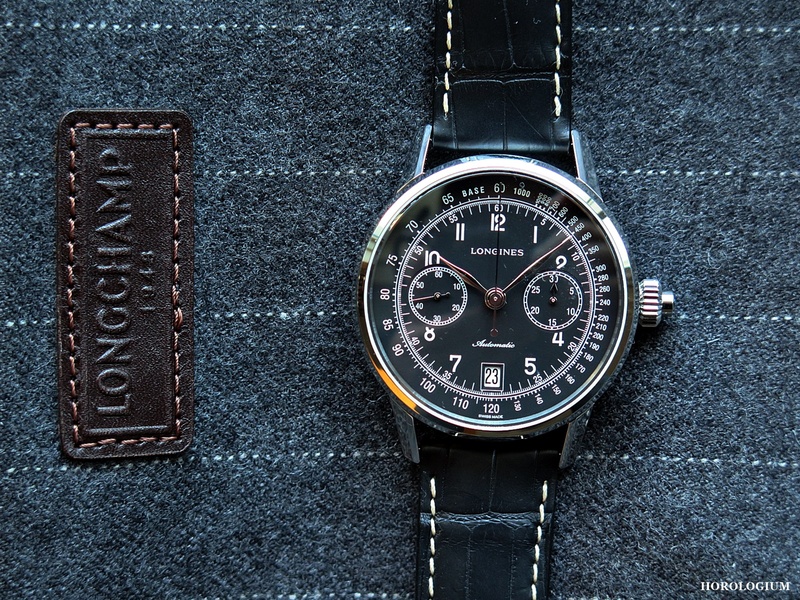 In recent years Longines have reissued a number of monopusher chronographs from their Museum as a part of its Heritage collection. A few months ago we looked at the new 2015 Pulsometer Chronometer monopusher with its Calibre L788.2 in a 40mm stainless steel case. Comparisons even within a brand are interesting, so today we are looking at an even newer model, released since Baselworld 2015 – what they have called their ‘Column-Wheel Single Push-Piece Chronograph’. It is not just the fact of another monopusher that is interesting, but (and there is one more that I will cover, in fact) there are design differences, and when we’re talking about watches whose reception is often to do with the details (date/ no date for example), these are worth noting. Coming in either matte black or white lacquered versions, I had the opportunity to see a non-working black model for a couple of days with thanks to Longines Australia, so I can only speak to this one. What I will say at the outset is that despite the core similarities of monopusher/ movement and to some extent, ‘look’ of them, to me there was a different ‘feel’ to this one when compared to the Pulsometer that went beyond just a dial design, but more on that later. This new-old model is 41mm and both the black and white dial versions are in stainless steel. The bicompax dial layout with 30-minute chronograph counter at 3 o’clock and small seconds at 9 o’clock is easy to read with the contrasting white numerals, markers and tachymeter scale. The hands on this one are rhodium-plated but for the white version, they are blued. To get an idea about Longines’ blued hands, just go to the Pulsometer post link here. This one comes on a black strap but the white lacquer dial model comes on a brown one. For those who are into ‘balance’ but do not like Longines’ preferences for adding date windows to modern re-issues, this one will hopefully bother you less, because it is discreet. Inside is the automatic Longines column wheel Calibre L788.2, which is based on the ETA A08.L11. The movement has 27 jewels, 28,800VPH, and a power reserve of fifty-four hours. The column wheel, visible through the sapphire case back, has a blued finish. Now, in terms of what I briefly alluded to at the beginning – this watch versus the Pulsometer. Press photos do not always reflect what something is like ‘in the metal’, as we all know, and much as I liked it in the photo, the physical fact of the Pulsometer didn’t seem to engage me as much as I had expected it to. This is kind of unusual, because the whole retro/ blued hands thing is right up my alley, but there was something in the realisation of the look that for me, and this is a very personal and thus subjective response, that was a little bright, and the ‘feel’ of the case in my hand was also less substantial than I’d expected. In comparison, today’s monopusher, which I have now handled on two occasions, has the impression of heft that I was hoping for in the Pulsometer. Its old-school chronograph look is modern and not too ‘shiny’ in its overall feel, the rhodium-plated hands look elegant, it feels comfortable on the wrist, and I can see myself wearing it. For those who are interested, the black dial is Reference L2.800.4.53.0-3 and the white dial, Reference L2.800.4.23.2-4. The Australian RRP for the black version is $3,950.